Your face is made up of layers of tissues varying in texture and consistency. These tissue layers overlie the bony skull, which provides the support for and structure of your face. From a cosmetic surgeon’s standpoint, your face is made up of the following components: skin, fat, superficial musculoaponeurotic system (SMAS), platysma muscle, Erb’s point (containing important nerves), deep cervical fascia and the retaining ligaments of the face. Mastering the art of tweaking these components in the correct proportion and in an aesthetically pleasing manor is the surgeon’s delight and goal, the reward being the facial iimprovementthat you desire. The thickness of skin overlying your face is variable - your eyelids have the thinnest skin while your cheeks and forehead are covered by a thicker skin. Facial skin is repeatedly exposed to the sun and elements. This skin is also affected by aging, resulting in loss of elasticity and the development of rhytids or wrinkles. 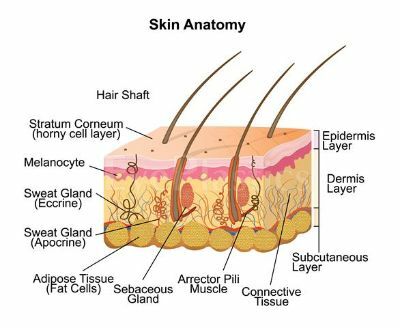 The skin consists of two main layers - the inner layer called dermis and the outer layer called epidermis. Our epidermis is what everyone sees! Fat is one of the most important components of your face and lies just beneath your skin, i.e. subcutaneous fat. It consists of lobules partitioned by fibrous septa which connect the inner layer of the skin, the dermis, to the superficial fascia just beneath the fat. The distribution of fat in the face is variable, with a major portion deposited right beneath your cheek as the malar fat pad. It is also found below the eyes, lateral to your nose, and in front of your ears. Fat accentuates your cheek bones nicely. The malar fat pad is propped up by connections to the orbitomalar ligament, the superficial musculoaponeurotic system (SMAS), underlying soft tissue, and bone. With age, the malar fat pad shrinks, causing the cheeks to droop towards the crease between your nose and lips. This drop of cheek tissue results in a deeper fold and shadow-- a definite sign of aging. 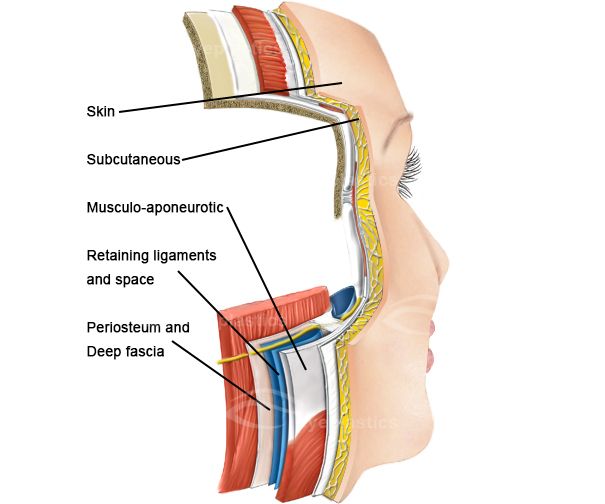 The SMAS or superficial musculoaponeurotic system covers and connects the muscles of facial expression to the deeper layers of your face. It lies beneath the fat layer of your skin and provides definition to your facial expressions. The SMAS is a thin layer of connective tissue that lies attached closely with the platysma muscle, frontalis muscle, galea and superficial temporal fascia. It is also closely attached to the superficial muscles of facial expression (including the orbicularis muscle), pre-orbicularis fat and the malar fat pad. The SMAS is attached to bone at the infraorbital rim, zygoma, and the mandible. The Platysma is a thin, flat muscle that begins in the chest just in front of your collar bone, the clavicle, moving up towards the face and covering the front and sides of the neck. It eventually attaches to your jaw bone and skin, then merges with several muscles and continues as the SMAS over the parotid (salivary) gland and cheek. Both sides of the Platysma merge at the midline just below your jaw line. As one ages, the platysma muscle becomes loosely attached to the underlying structures resulting in vertical banding and bowing under the chin. The Deep Cervical Fascia is a connective tissue in the neck that covers and protects the muscles, nerves, blood vessels and glands of the face. Surgery deep to the deep cervical fascia can result in injury to the facial nerve, which is the primary nerve supply to the face. Damage to any of its five branches could cause weakness of the muscles supplied by that particular branch. Utmost care must be taken to avoid injury to the facial nerve or its branches. Erb’s point lies vertically below the ear canal just behind the sternocleidomastoid muscle and represents the point of emergence of several nerves that provide sensation to the neck and lower face. It lies just over the sternocleidomastoid muscle. Its largest branch, the greater auricular nerve emerges 6.5 cm below the ear canal and provides sensations to the lower portion of the ear and area just behind the ear. Hence, it is important to meticulously dissect this area to avoid damaging any of these nerves. Osteocutaneous ligaments: connecting from bone to the inner layer of the skin (the dermis). Zygomatic and orbito-malar ligaments suspend the soft tissue of the malar region. The submental crease is formed by the mandibular osteocutaneous ligament. 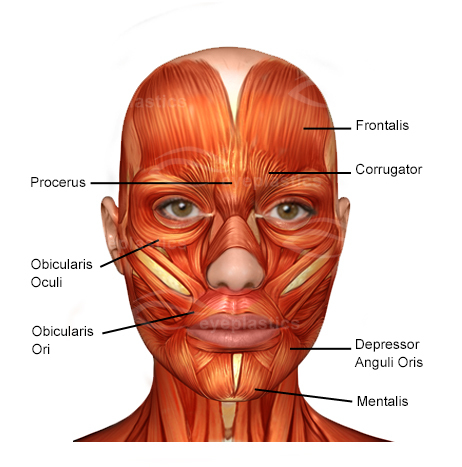 Fascial-cutaneous ligaments bind the superficial and deep fascial layers of the face.